A really quick and easy, delicious veg recipe by Richard. Cube the tofu. Combine tahini, lemon juice, ponzu-soy sauce, veg stock and pour over the tofu. Tune ingredients to taste. Shake on lots of black sesame seeds. Lightly brown fish on both sides in hot oil. This gives color and also cooks the curry powder. Add coconut milk, lime juice, soy sauce; simmer fish until it is done (when pierced with a fork there should be no resistance). Fresh cilantro is a fine optional garnish. Serve immediately. You can store some of the fish for serving the next day. Unused coconut milk can be frozen. Henry here again. I am focusing lately on some of Richard’s recipes that have all the amazing flavor of his cooking while being simple enough that even I can make them. This recipe qualifies amply in both regards. The resulting soup makes a heavenly introduction to any meal, or could be served as a dessert. To make this fruit soup, just assemble the ingredients, then puree them in a blender. 2 cups ripe sweet melon. You can use any melon that is fragrant. Richard likes using honeydew or orange-honeydew. If you use honeydew, choose one that shows some veining in the skin. But fragrance is the key. Optional garnish for carnivores: Saute slices of prosciuto di parma until crisp. Blot them on a paper towel, chop fine and sprinkle on top. This is Henry talking, with a recipe that Richard taught me. I love it because it tastes fabulous, yet is simple enough for me to make. I also love its simplicity: it has only 3 ingredients, and no added flavorings or herbs. Almost all the “cooking” is done in the garden, so this recipe relies on the quality of the ingredients. Slice the squash in half and scoop out the seeds with a spoon. A melon-baller is a particularly handy implement for the purpose. Microwave the squash in a covered pyrex bowl for about 15 minutes. The covered bowl assures that the squash will steam as well as microwave. The flesh should be tender now–if not, microwave a bit more. Scoop out the flesh and put in a food processor. This is the hardest step, since it can be painstaking work to separate the tender squash flesh from the hard skin. Spin the squash flesh in the food processor together with 1/2 cup olive oil (more or less to taste). It might take 5-10 minutes to get the squash perfectly smooth. The squash puree will freeze nicely, or can be served right away. You can always heat it more in the microwave. Nothing exotic here. Bring a pot of water to the boil and then turn it down to the lowest heat. Add 2 eggs, and let them cook for 2 minutes. They should be cooked, but the yolks still soft. Spoon out the poached eggs with a slotted spoon onto 2 bowls of pureed squash. Serve immediately and enjoy. When you eat, the soft yolks will blend nicely with the squash, in a medley of yellowness. Yum! I’m wild about Kabocha squash. When autumn comes, I head for those gnarly green pumpkin-like winter squashes. Some kabochas are orange-red, but I prefer the green ones for these recipes. For soup or as a side dish, they’re the best. While you may use any winter squash or pumpkin, none has quite the delicious flavor of Kabocha. 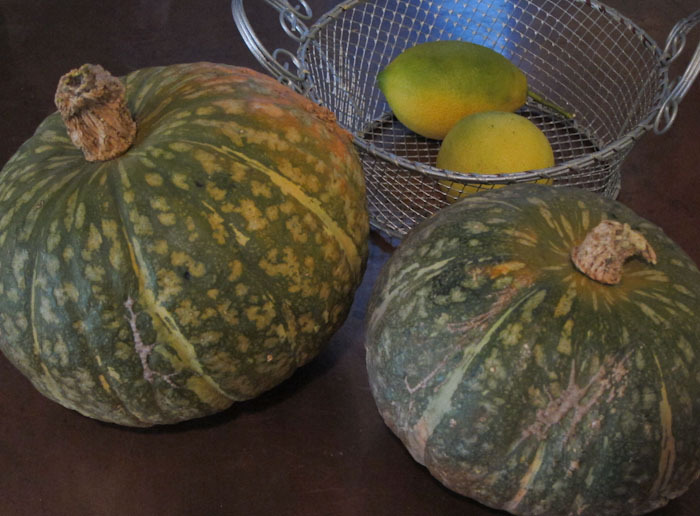 Kabocha looks like a dark green pumpkin and is sometimes referred to as Japanese pumpkin. A kabocha that's ready for slaughter. Note the crusty protuberances that indicate a mature specimen. If the kabocha is smooth and shiny green, it is immature and will not have the deep flavor that’s best for this recipe. 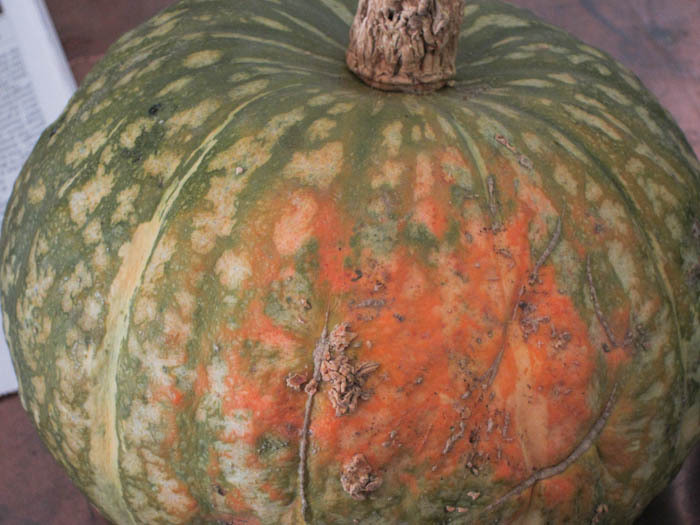 Unlike most squash, the kabocha needs some time to age after it has been picked to develop its deep rich flavor, which at its best even has a hint of chestnut. Find one with a dried stem and lumpy rough skin, often with raised, dried bumps. It doesn’t look pretty in a conventional way. It should also feel heavy, which indicates a thick flesh. I like to use kabocha in several ways—as a side dish, either roasted cubes or a smooth puree, and as a delicious soup. It can be used in any recipes calling for pumpkins and will provide a better flavor for any pumpkin dish—even pumpkin pie. The easiest way to cook the flesh is to microwave it. It may also be steamed or roasted. The method you choose depends on how you plan to use the squash. If you are planning to use it as a non-pureed vegetable side dish, I recommend roasting it. If you are making a puree or soup, microwaving or steaming is easier. All the methods will work. All recipes start with separating the flesh from the skin. Then, you have the choice of roasting, steaming, or microwaving the squash. Carefully pierce the squash in several places with a sharp paring knife. I usually pierce the top of the squash to minimize the risk of the knife slipping. Be careful. Microwave the whole squash for 5 minutes. This will make cutting and peeling easier. 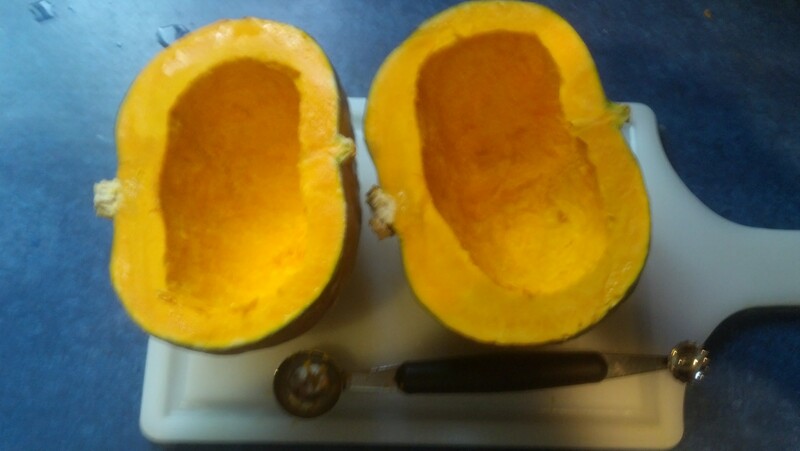 Carefully cut in half with a sharp knife, and scrape out the seeds. 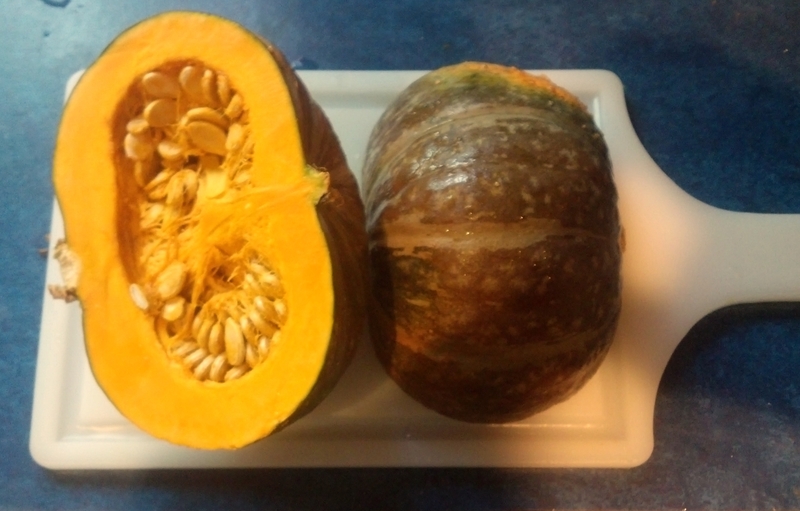 If the seeds are nice & plump, they can be washed, dried, and roasted like any pumpkin seeds. With a sharp peeler, cut away the skin. It comes off easily. It’s safest to cut away from yourself—less chance of slipping and slicing you. To get a better grasp, use a paper towel to grab the edge as you’re peeling. Remove all the outer skin. Cut squash into 1-inch cubes, if you are roasting it for a side dish, or larger, even-size chunks, if you are microwaving or steaming it. To roast for a vegetable side dish, toss with salt, vegetable oil, or herbal marinade (recipe follows). I like to spray the roasting pan with non-stick spray to keep the squash from sticking to the pan. Roast in a pre-heated 375 degree oven, until lightly browned and tender, about 40 minutes. Stir and turn the squash every 15 minutes for even cooking. Using an herbal marinade vastly improves the flavor of the roasted squash. To prepare the herbal marinade, use some combination of the following herbs: rosemary, thyme, sage. Sage is very complementary, but has a strong flavor, so use judiciously. Put the selection of herbs into a blender jar, with one part herbs to 2 parts oil—olive, corn, or canola, i.e., one tablespoon herbs to 2 tablespoons oil. Add a few cloves of garlic, a pinch of salt and fresh-ground pepper to taste, and 1 or 2 Turkish bay leaves (I find the California bay leaves much too astringent). Blend them to break the herbs down as a finely as possible—5 to 10 minutes depending on the strength of your blender. Strain the mixture through a strainer and it is ready to use. Any excess marinade freezes well for future use. If you want to steam the squash, peel and cut into 1″ cubes. If using a steamer, place into the bottom of a pot and add water to 1/2 inch below the bottom of the steamer. Cook, covered, until the squash is tender—approximately 35-40 minutes. You may want to stir once for more even cooking. Cover with a microwave-safe plate. Cook at high in 10 minute increments until tender (30-40 minutes). The bowl will be very hot, so remove carefully from the microwave, to avoid being burned. 1 teaspoon sage, or scant 1/2 teaspoon dried sage. Prepare the squash as described above, microwaving, steaming, or roasting it. Clean the leeks by cutting lengthwise and running under cool water to remove any sand. While most recipes call for using only the light green and white parts, the dark green outer leaves are full of flavor. Unless they are desiccated and bruised, they are very usable as long as they are well washed. Since they are tougher I usually cook them separately from the more tender parts of the leek. Slice the leeks (or onions, yawn) into 1/2 inch pieces and cook with the garlic in 1 tablespoon of olive oil, covered, over a medium heat until tender, 20-25 minutes or until meltingly soft. Be careful with your flame and avoid burning by stirring every five minutes; be sure to scrape the bottom of the pan when you do. I use the non-reactive pot I will be cooking the soup in to save cleanup. When leeks are ready, add the squash, stock and wine/sherry, bay leaf, thyme, salt and pepper. Simmer for half an hour. Allow to cool to lukewarm. Peel the apples or pears, cut into small dice, toss with the lemon juice, sauté in 1 tablespoon of hot oil until lightly golden, drain or blot on paper towels and then set aside. Remove the bay leaves from the stock. Use a blender to puree the squash and stock mixture. Be careful—if the mixture is too warm in the blender, it can splatter all over. So allow the stock to cool before this step. If you keep the blender lid slightly ajar and start on a slow speed this can be avoided. Taste and add salt and pepper if needed. If the Queen herself is coming to dinner you may strain it for a perfectly lump free soup. Otherwise it’s ready to serve. Chopped Italian parsley, basil, or chives add a nice herbal touch. If the apple/pear step is too daunting, you may use diced dried fruit; add it to the soup before the final reheating, do not puree. grated cheese, a quality cheddar is a good choice as well as Piave a firm flavorful Italian cheese I love. tofu. I like the soft custardy tofu. Add tofu to bottom of the bowl and pour very hot soup over it. nuts, lightly toasted—almonds, walnuts, pecans, pistachio or pine nuts. a disk of warm goat cheese in the bottom the bowl waiting to be discovered. sliced or rough chopped, roasted chestnuts. Best is to use fresh chestnuts, either roasted or boiled, but this can be very labor intensive. Vacuum packed chestnuts are acceptable; be sure to pick through them to remove any remaining membrane fragments before using. An exciting development is the availability of fresh American-grown chestnuts. (A Google search will let you know how to order them online.) The big advantage of these chestnuts is that they peel very easily, including the membrane (pellicle) that covers the chestnut kernel. If you have tried this with imported chestnuts, you know how frustrating and difficult this can be. Place the flatest side down on a cutting board and carefully cut in half, drop them into boiling water, and simmer for 5 minutes. Drain. As soon as you can handle them, peel the shell and pellicle off. Use only nuts with a creamy yellow color. Avoid those with discoloring and brown spots. I then simmer them in some stock until tender. I then poke them with a flat spatula to break them into smaller pieces. Stir into the soup while heating before serving. Chestnuts are low in fat, and perishable, so keep in the refrigerator until ready to use. I also like to drizzle a little extra virgin olive oil over the surface. Serve with crusty bread, ideally lightly toasted and drizzled with extra virgin olive oil. I serve Kabocha two ways as a side dish. First is roasted cubes of squash with herbs, and second is pureed with leeks, garlic and olive oil. Pureed is my preference—it’s a wonderful comfort food, like mashed potatoes, and is delicious. Prepare and peel the squash as above, cutting it into one inch pieces. I recommend the roasting method for the best flavor. Once it’s cooked, it is ready to serve. If you are steaming, I suggest a drizzle of extra virgin olive oil before serving. To make a squash puree, place the cooked squash into the bowl of a food processor. For every cup of cooked squash, add 1-2 tablespoons of extra virgin olive oil. Puree until smooth. You can add a tablespoon or two of boiling water to help the process. Adding 1/4 to 1/2 cups of cooked leeks will contribute extra flavor and texture, resulting in a more delicious flavor. Another good addition is roasted garlic. I like to add several cloves for each cup of cooked squash. It is ready to use. Squash puree freezes well and with some stock can quickly become a soup. I love this soup because I can make it quickly – and it is delicious. It is relatively simple to prepare. You can use a vegetarian stock or a chicken stock. I salute you if you make your own stocks. In the real world this is not always possible. To improve the flavor of a commercial stock, simmer the stock with some aromatic vegetables and some herbs. I recommend some combination of carrots, celery, onion, leek greens, garlic, parsley stalks, a few sprigs of fresh thyme or a pinch of dried. Simmer for 20 minutes, strain and use. It makes a world of difference. Commercial stocks tend to be high in sodium, so add extra salt with care. Some high end food markets sell their own homemade stocks–expensive but often quite good. Of course nothing beats homemade. But……………. I use leeks instead of another member of the onion family because they add a creamy texture on the tongue and a delicate flavor that complements the peas. You could make this with onions, but it would not be as divine. This soup freezes well. So make extra for a luscious green ambrosia that you can stash in the freezer. 1 quart vegetable or chicken stock–packaged, home-made, or packaged-and-enhanced. You can add more if you prefer a thinner soup. I prefer petits pois, but any shelled pea will do. Let peas defrost. Canned peas just do not have the flavor or texture and should be avoided altogether, always! And much to my surprise I often like the results with frozen peas over fresh. But if you have fresh peas that are not too starchy, they can be used. Simply drop the peas into boiling water for 2 minutes and then drain and refresh with cold water to set the green color. Proceed with the recipe as follows. Cut leeks into one inch pieces and cook with the olive oil over medium heat, covered, until they are meltingly soft. Cooked leeks freeze very well so consider making extra for another dish. Combine the stock, peas, and leeks, which should all be at room temperature. Puree in a blender in batches using the highest setting until the mixture is emulsified. If you have a ‘super blender’ like a Vita Mix, the soup will need no straining. If you have only a standard household blender, I recommend pressing it through a strainer to remove any bits that did not get pulverized. The most efficient way to accomplish this is to use a ladle. Stir in the black pepper, taste and adjust the salt to your liking. To serve, heat until it is just below the boiling point, steaming hot. Ladle into warm bowls and enjoy. There are several ways to garnish the soup if desired. Drizzle a stream of extra virgin olive oil. This is a good place to use a fancy estate oil. Dust with finely chopped herbs such as chives, flat parsley, tarragon or basil. If you are drizzling cream or basil oil, I suggest serving the other garnishes on the side–let each person serve themselves. My favorite garnish is to make a basil oil so I can drop ‘lily pads’ on the surface. A bit more work, but very easy to make. stir the basil leaves into the boiling water for thirty seconds and then drain into a strainer. rinse with cold water until they are cool to the touch. This sets the color. Don’t delay the next steps–basil oxidizes quickly. gather basil into a ball and squeeze out as much water as you can. You may also squeeze and then press between paper towels. Damp, not wet is the goal. pour and scrape the basil oil mixture into a strainer with a bowl beneath. Let the basil oil drip through. You may pres it lightly with a spatula but do not agitate the mixture. The oil will be a brilliant green–think of Liz Taylor’s emeralds. the remaining basil and oil in the strainer can be used to add flavor to another dish or be turned in a pesto sauce. Tightly sealed, it freezes well. the basil oil is now ready to use as a garnish. Drop small circles on the surface of the soup. You can leave them or run a knife through them to create different shapes. Or do your best emerald Pollack. A squeeze bottle, available at any restaurant supply store, makes this easier. This recipe is based on the Joy of Cooking‘s recipe for chocolate chip cookies. Several variations follow the master recipe, along with suggestions and ideas. It’s best to bake in the center of the oven preheated to 350 degrees. Use parchment paper for easy cleanup and nonstick surface, or use lightly greased cookie sheets. It’s better to bake multiple cookie sheets, one at a time; they bake quickly and the heat distribution will be better for even browning. Stir the flour mixture into the butter mixture until well blended and smooth. 1½ cups finely chopped crystallized ginger**. At this point you are ready to put the cookie dough on the baking sheets. I like to use a mini one inch diameter ice cream scoop to portion the dough. You can use the old drop from a measured teaspoonful method but I find it hard to control the size of the cookies that way. Either way, I lay a sheet of plastic wrap over the cookies to gently press them down to flatten. Place the cookies an inch apart (flattened) on the sheet to allow for spreading while baking. Sure beats that fork dipped in water and pressing each one method grandma (bless her) used. You may bake them now. Otherwise, refrigerate or freeze for baking later (leave the plastic wrap on them) Once frozen, pack into zip lock bags. They can go straight from the freezer to the oven–just add an extra minute or two to the baking time. Another approach is to save the dough as flat rectangle by packing it into a one gallon zip lock bag. Smooth the dough flat and remove most of the air from the bag. Refrigerate until firm. At this point you can bake them or just pop into the freezer for future baking. I love having frozen dough on hand, then fresh baked cookies are always available quickly. The dough is ready to go. You can also use quart sized bags for portion control. Make a double batch – bake some now and some later. When you’re ready to bake, cut open the bag, lay the sheet of dough on a cutting board and cut to the size you desire. The thickness will be good. Place an inch apart and bake until just slightly colored on top and browned around the edges, 8-10 minutes. Rotate the tray halfway through baking for more even browning. Allow cookies to cool for two minutes once removed from oven before moving to cooling racks. Store the cookies in the refrigerator in airtight containers for one week. They can also be frozen after baking; just be sure to wrap well before freezing. *For vanilla bean, lay bean on a cutting board, press with the flat part of a knife to flatten. Slice through down the length of the bean. Separate and then scrape the seeds by running a sharp knife across the cut portion. Add to cookie dough. Save the bean and add to the cooking liquid for hot cereal or flavor milk for a custard or steep with tea or put in a jar with sugar to infuse vanilla flavor. **Trader Joe’s sells an inexpensive candied ginger. It is not necessary to use the fancy Australian ginger ‘coins’ although I have used them with good results. Avoid the dense candied ginger, it works but is more difficult to chop. A light coat of non stick spray in the food processor bowl and blade will help keep the fruit from sticking. Add a teaspoon of ground cinnamon. A teaspoon or two of grated lemon or orange rind may be added to the butter mixture. In place of ginger you may use any dried fruit – apricot, peach, mango, blueberry, any berry, apple, pear or your favorite. Just be sure to chop into small pieces. For chocolate chip cookies substitute 1½ cups chocolate chips. For better flavor chop a better quality chocolate bar into small pieces. For an extra chocolaty flavor substitute 1/4 cup of flour with cocoa powder. By dividing the basic dough in half you can make two different kinds of cookies. Just use half the amount of added nuts, fruits, or chocolate ingredients called for in the recipe. One last trick, if you are shipping cookies to someone, pack them in freshly popped pop corn. Pop corn makes good edible insulation against breakage. And that’s your cooking lesson for today!